The store was averagely affordable. I checked the price for the erectile dysfunction medications available on the drugstore. The site was only stocking sildenafil citrate. The only generic sildenafil citrate available on the site was Kamagra which has its source in Ajanta Pharma located in India. If a buyer purchased Kamagra Gold 100mg tablet, he would have to pay 3.5 dollars for the pill. Kamagra jelly was available at a price of 2.8 dollars per 100mg sachet. The price for a pill of brand Viagra on Global Steroids was 5.5 dollars. These prices are lower than the price for brand Viagra in the local pharmacies. However, they are not the lowest prices for ED meds on the web. The pharmacy was only clear on one method of payment which buyers could use to pay for their meds. The method was the Western Union. 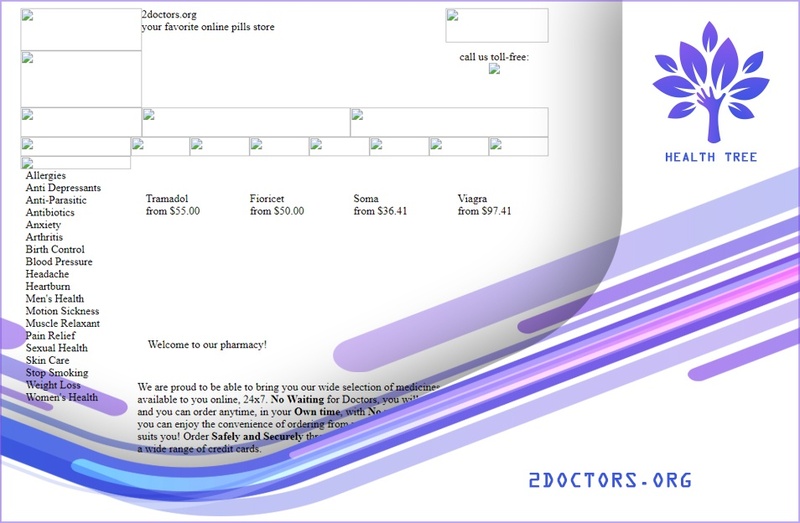 The pharmacy indicated that buyers would get the instructions on how to pay for their meds in their email after placing an order. I did not like this payment method since buyers couldn’t dispute any charges if the pharmacy failed to deliver the meds ordered. The minimum amount of products a buyer could have ordered from Globalsteroids.com had to be worth 400 dollars. The pharmacy was shipping medications using discrete packages. The buyer, who would open the package, was the only person who would know what was inside it. The orders were being shipped within a period of 1 to 2 business days. The pharmacy was using both regular shipping and express shipping. The regular shipping was costing the buyers 19 dollars while the express shipping was worth 49 dollars. After the meds had been shipped, they took approximately 5 to 17 days to arrive depending with where the buyer was located. The pharmacy was shipping to PO Boxes. 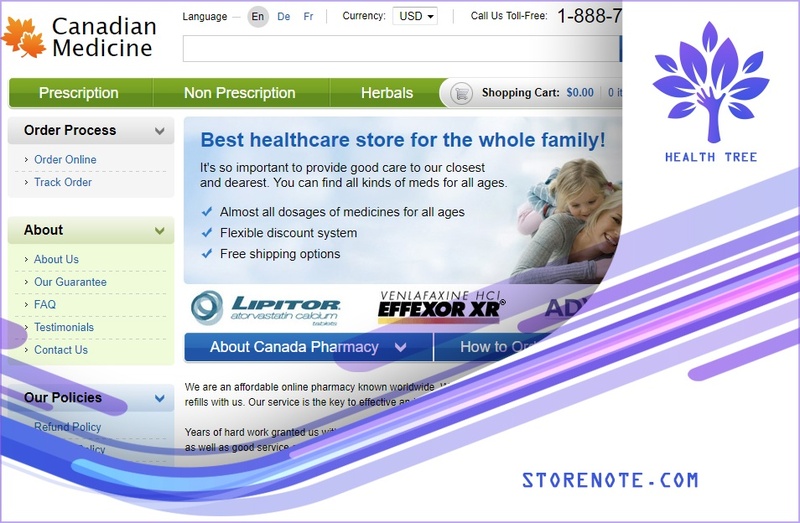 The drugstore was not asking for a prescription in order to dispense and ship medications. Globalsteroids.com did not have a phone number or an email address. Buyers who wished to talk to the Global Steroids customer support department could have done this through the contact page available on the website. The first reviewer reported that he never received his order. The pharmacy was not responding to his messages. He indicated that Globalsteroids.com is a scam and even discouraged other buyers from sourcing their drugs from the website. 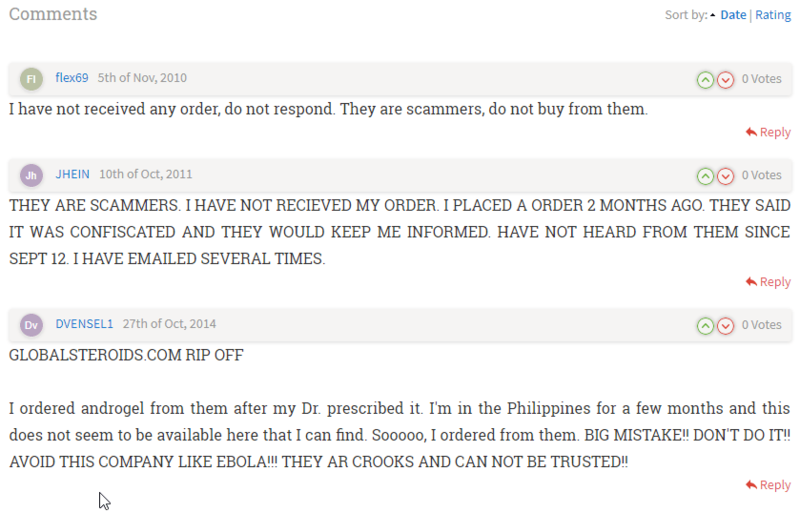 The second reviewer says that Global Steroid is a scam. He never received his order. 2 months had already passed. The pharmacy had informed him that the order had been confiscated and they were going to keep him updated. He had never heard from the pharmacy. He had emailed the drugstore several times and they never responded. The last reviewer reported that he had ordered Androgel from Globalsteroids.com after his doctor had prescribed it to him. He was in the Philippines and the medication was not available there. After ordering, the medication never arrived. He says that Globalsteroids.com was being run by crooks. One thing that is clear in all the reviews above is that Globalsteroids.com was a rogue pharmacy. The drugstore only focused on ripping people off and never delivering medications. This is probably why the pharmacy is not online anymore. It drove its customers away with its tendencies to steal from them. 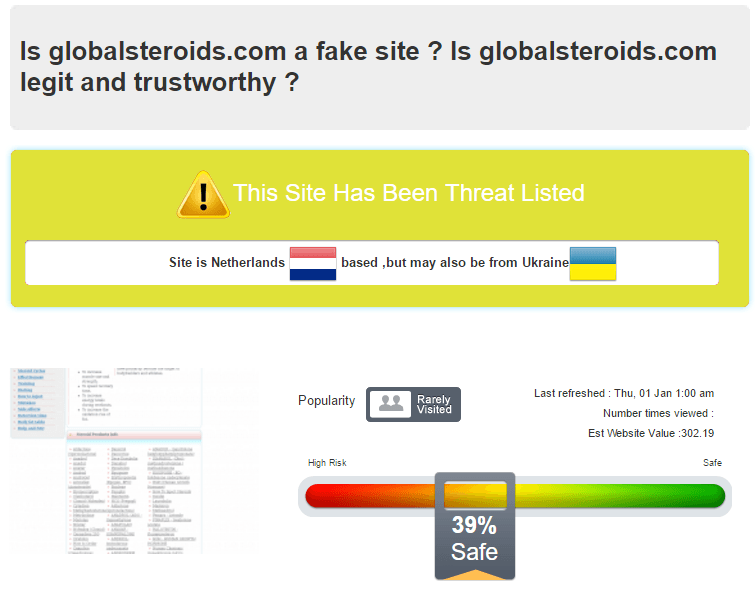 Scam Adviser indicated that Globalsteroids.com had already been threat listed. Sourcing drugs from a pharmacy that has been threat listed is never a good idea. There is a high chance of you getting ripped off. Globalsteroids.com was hiding its actual physical location. Scamadviser.com could not determine whether the drugstore had its location in the Netherlands or in Ukraine. Global Steroids had a 39% safety rating. It is never advisable to Trust a drugstore that has only a 39% safety rating with your health and money. Even when I was searching for Globalsteroids.com coupon codes, I was not expecting to find any. The drugstore was a proven scam site. Therefore, the chances of the pharmacy having any coupon codes were very sleek. Anyway, I searched for the coupon codes and my search did not come up with anything. 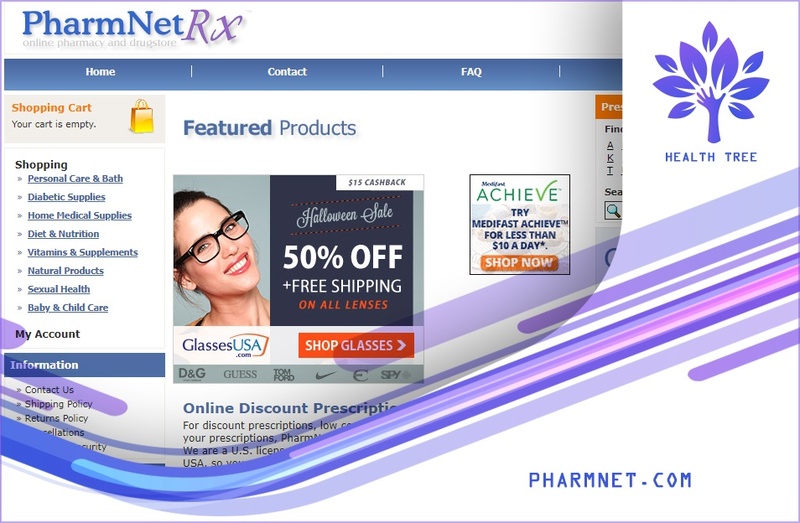 Pharmacies with coupon codes are more attractive to customers. The coupon codes offer buyers a chance to pay less for their meds. Globalsteroids.com had a large collection of meds although these could treat very few health complications. The large collection on the site never helped anybody since anyone who has commented after having paid for his or her meds at Globalsteroids.com said that his money disappeared but the medications were never delivered. The store focused on accepting payments via western union since the pharmacy owners were already aware that no one could dispute money paid via western union.